The best, happiest news! Thank you for keeping everyone posted. Stunning, gorgeous photos! Wow! Thanks to everyone who made this happen. Bless the ospreys for hanging in there. Thanks again, Dan for your outstanding coverage. Great photos Carolyn. Thank you everybody. This made my day. Thank you so much for the update and the wonderful photos. Spectacular photos, especially the top one. This is so beautiful! …..and they seem to be happy if you can say so! Aww… this makes me so happy. What a great start to a beautiful spring day. Thanks, Dan! Great coverage here. Think you helped make it happen. I nominate Dan Woog for Unsung Hero. What a good deed. Thanks, Leslie. But I nominate all of Westport! Teary-eyed, those pics made me; especially the first one, of course…sweet. So great!! Made my day. I agree with Leslie Wolfe….you definitely were the UNSUNG HERO in this saga!! What a happy ending! All that commotion and lying when the truth would have been sufficient. Regency has a terrible track record in the two Post Road Properties. This is indeed wonderful but don’t forget the PZ mtg tomorrow night. Regency Centers must be held to account and their disingenuous ‘apology’ based on ‘community feedback ‘ isn’t really enough. Let us show up in force, be respectful and ask intelligent questions. Once again thanks to Dan and all the amazing people who made this happen. And let’s keep advocating for all the creatures that make Westport and this world so beautiful! Wonderful sight. Heart warming! Thanks Dan for spreading the word!! 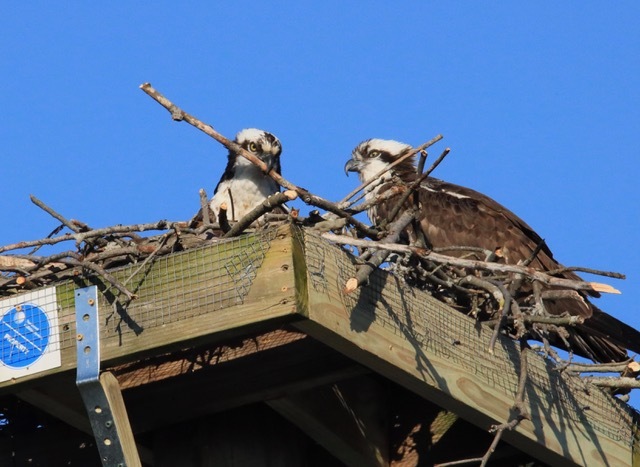 How come ospreys need platforms built by humans? 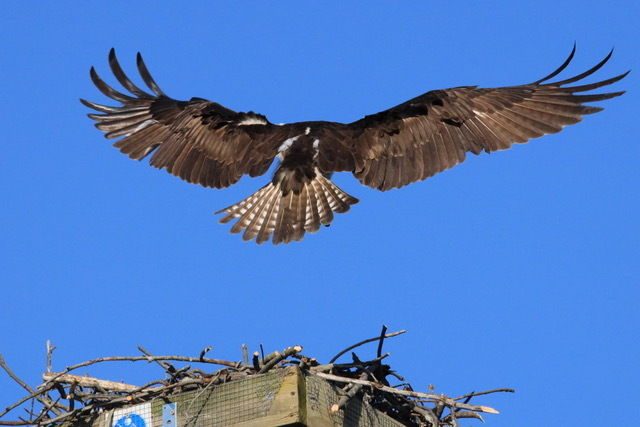 Back in the 70s or 80s when the osprey was almost extinct I photographed them on Gardiner’s Island, a place that has hardly changed in centuries, and the ospreys made their own nests in trees. Based on what I’ve read, platforms are used to give the birds a more favorable alternative when they start building nests in less than optimal places in the same vicinity (in this case, power poles). I can’t answer why these birds chose the power poles over trees in the area, though. exquisite photographs to remind us of the beauty Nature affords us. Thank you Dan and all those who made their voices heard. So wonderful this humane ending. More great photos! 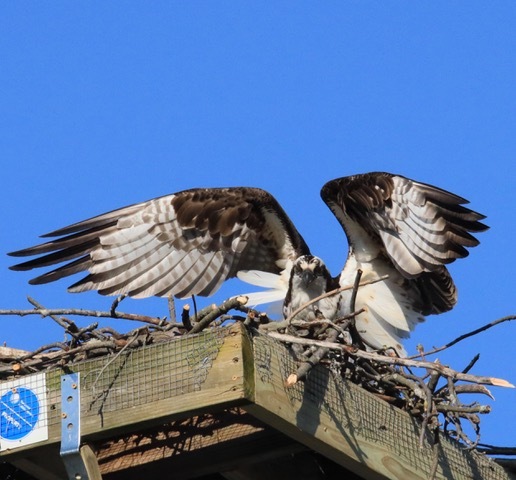 I think it’s great that so many people are following the ospreys and learning so much about them. Thanks for all you do, Dan! 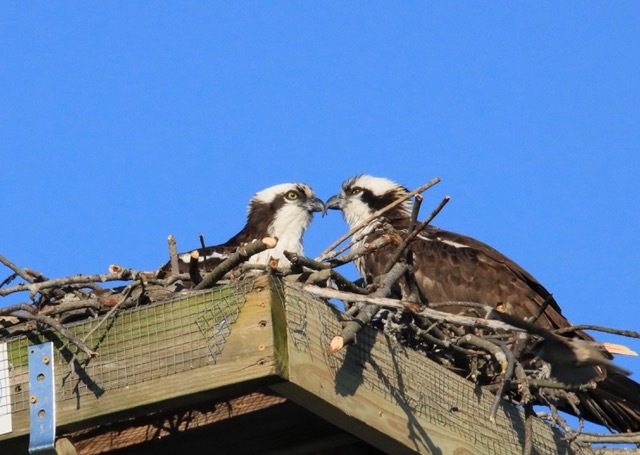 The ospreys look pretty happy. This just makes me so happy! Great pics….very happy ending !! Hopefully, Regency will let the nest stay and not take it down after the new babies have flown the coop. The Co. created a P. R. nightmare for themselves and they should be called out on this whole episode. Thursday night is when us Westporters should let Regency know how disappointed we are in the actions they took. Thanks to you, Dan Woog, for keeping this matter front and center, and to all those who grabbed onto it and ran the gamut to right this terrible wrong! In the second photo there appears to be a Property sticker…can’t tell if it is CL&P. Anyone know? Certainly not Regency property to remove. Looking at the wonderful photos, one is reminded of how thoughtless and cruel were those bastards who took the nest down….as pleasing as it is to have the nest and the birds back, it is disheartening to know that such people exist. Observation from afar: in the photos it appears that the metal straps holding the platform to the pole have 4 holes for screws to secure the straps to the platform – with screws in only 2 of the available holes. Why? Oh well, we know the answer… At the very least all 4 screws should be present. The stick nest is heavy, the birds are heavy. Strong winds and drenching rain (yes, global warming is real and happening every day) can make this top heavy situation even more tenuous. Strong gusts of wind, a big nor’easter for example, could blow the platform off the pole. But before next year when the birds return knowledgable people could make the platform much more secure… even by just installing those missing screws. Other measures to secure the platform could also be made. Just saying…. Reminder, the Planning and Zoning hearing for Regency Center’s proposed changes to this property tonight at 7 pm. The public can view their plans at the Planning and Zoning office in Town Hall.